Following the rollout of Open Banking regulations in the UK and the launch this year of the EU’s Payment Services Directive 2 (PSD2), countries across the Asia-Pacific region are following suit to establish their own frameworks to enable banks to share select customer data with third-party providers (TPPs), and TPPs to run transactions on customer accounts. As in Singapore, Malaysia’s approach to Open Banking, while less comprehensive than that of its city-state neighbour, has been to establish a non-mandatory framework and to support banking transformation with the creation of implementation teams. There are currently no timelines for implementation. Malaysia’s central bank and principal financial services regulator, Bank Negara Malaysia (BNM), established a Financial Technology Enabler Group (FTEG) in June 2016 to support innovations in the sector. The FTEG is responsible for formulating and enhancing regulatory policies related to the adoption of new technology in financial services in the country. Accordingly, in mid-2017 it launched a Fintech Regulatory Sandbox framework to allow the testing of applicable technology, including Open Banking. In its final quarterly bulletin of 2017 [PDF], BNM focused on open APIs and their potential impact on the country’s financial sector, promising to establish an Open API Implementation Group in early 2018. This was set up in March, with a remit to develop standards on open data, security, access rights and oversight arrangements for TPPs, and to review existing regulations covering controls on customer information. Also in March, the BNM set up an Interoperable Credit Transfer Framework (ICTF), which promotes collaborative competition for mobile payments. The government is prioritising the impact of new technology on the banking sector, with insurers and government agencies a secondary focus. Banks have already seen the opportunities and risks, with some acting to anticipate and benefit from the impact of the country’s vibrant fintech scene, although in the main they lack the capabilities to launch and scale open APIs. CIMB, for instance, launched its fintech incubation programme as early as 2015, targeting and mentoring startups for their API platforms. The bank subsequently released a point-of-sale and payments platform. Standard Chartered in early 2017 launched a global developer sandbox with limited API capabilities. Later that year, Maybank also launched a developer portal equipped with 20 APIs, enabling 85 differing operations. Hong Leong Bank, meanwhile, runs a “LaunchPad” contest to develop innovations, which led to the successful launch of five applications in its first year. Another significant development that banks in Malaysia seized on was BNM’s granting in December 2017 of an e-money license to WeChat Pay, the payments platform run by Chinese tech giant Tencent. Hong Leong Bank, Maybank, Public Bank and CIMB subsequently partnered with WeChat Pay. Partnering with fintech innovators is one way banks in Malaysia are monetising Open Banking APIs; bank-specific POS systems have also been sold with payment-API connectivity. Predetermined pricing models—subscriptions, per-call and flat rate charges—have also been used. So far, successful open API use cases such as Maybank’s Treats Card app, on the Maybank2u platform, have been focused on retail customers. Several global, regional and Malaysian banks have granted developers access to their APIs via publicly available developer portals and sandboxes. Maybank, OCBC and DBS have advertised various applications and partnerships that have arisen from the use of their developer platforms. 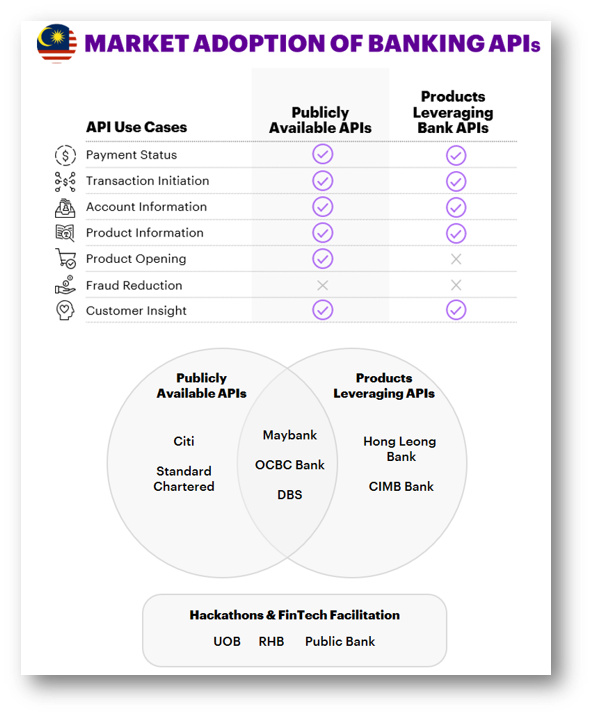 Some other banks, such as CIMB and Hong Leong, have been more selective, privately choosing which fintechs can access their APIs. The use of developer portals and individual selection means that Malaysia has a number of siloed Open Banking use cases and products. The country’s Open Banking future will depend on how banks, fintechs and regulators develop a common framework and infrastructure that supports a cohesive ecosystem. The ASEAN Financial Innovation Network (AFIN), has been established to do exactly that. AFIN, which is supported by the Monetary Authority of Singapore (MAS) and the International Finance Corporation, aims to accelerate fintech innovation, digital transformation and build an Open Banking ecosystem across the region. This gives Malaysian fintechs and banks the opportunity to develop the infrastructure and capabilities with other geographies to support a regional Open Banking ecosystem. Like Singapore, there are risks in Malaysia’s approach: without enforced compliance, the standardisation and adoption of APIs across the country could prove difficult. There is also uncertainty around when the Malaysian authorities will impose regulation. In Malaysia as well, further opportunities will present themselves to drive retail and SME customer adoption with additional services and reduce the cost of servicing banks’ customer bases. Ecosystem platforms for real-time data sharing between banks and regulators will enable new use cases and shared revenue models—and, ultimately, enable banks to build their own TPP services using their competitors’ APIs. This article was written in collaboration with Ewa Wojcik, Sam Waldman and Hakan Eroglu. Many thanks for their input, research and analysis.